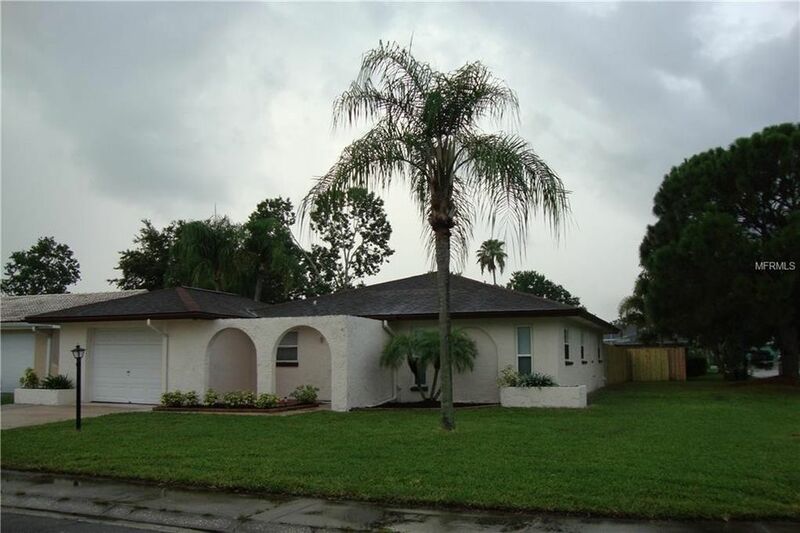 Adorable and affordable home 3 bedroom in Oldsmar. Ready to move into today! Renovated kitchen with brand new granite counters and stainless steel appliances. Master Bathroom newly tiled shower in beautiful neutral decor and new vanity. Guest Bath has new tub, toilet and tiled shower area and new vanity! No carpet, tiled floors in wet areas and laminate in living/family and bedrooms. Floor plan offers dining room, living room and a large Family room with volume ceilings. Ceiling fans in bedrooms and living areas. Family room addition in 2007. French Doors from Family room lead to back yard. Fenced yard perfect for Fido. Newer windows were installed in the last 4 years. Owner believes a/c is 2010. Extra newer fridge in garage (never used) conveys with property. Hurricane coverings for windows saving in insurance costs. NO FLOOD INSURANCE! Oldsmar has lots of shopping, restaurants and waterfront parks for your enjoyment and is conveniently located to the airports, beaches, Pinellas trail, dog parks and a water park for kids. Directions: Tampa road to Oakleaf Blvd to Ironwood Ct E.